Please abide the rules we have set. They are for your own safety. Along with serving as our Management Office, the clubhouse also contains meeting rooms & a kitchen for resident' s entertainment usage. Clubhouse Rules. Whether it's your racket or not, you're sure to have fun on our tennis courts. Our lighted courts provide a professional atmosphere for day and night games. Our playscape is a wonderful place for your children to play and get their much need exercise. A beautiful tree covered landscape surround the playscape; shading you as you watch your children's excitement on those hot summer days. Get back in shape today! 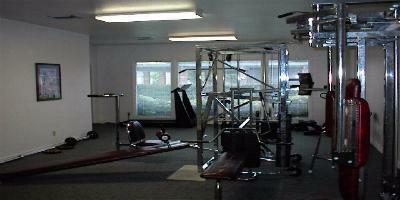 With our fitness room, there is no need to spend that extra $40.00 plus for a gym membership. You can be back to the body you want with only a minute drive from your home. River access park is perfect for picnics. Covered picnic tables located next to the river provide a beautiful view for your day with the family.